The Motonaut lightweight luggage system for motorcycles is a simple, but effective product. At first glance it doesn't look like anything special, but when you get it installed and go for a ride the design really shines. Motonaut is a company based in Sweden and they are growing quickly in Europe. A fellow rider named Kristofer Svensson decided to develop a better way to carry luggage on his dual sport and enduro motorcycles. He currently offers two versions of Motonaut luggage. There is a Motonaut Raid that allows for one tail bag and two bags strapped in on each side, and the version I will be reviewing, is called the Adventure. The Motonaut Adventure will accommodate two bags on the tail. Two of the long luggage straps. Two smaller straps that let you remove the dry bags separately. Like I said earlier, I didn’t notice the quality of the Motonaut at first. When I started working with it to get the bags strapped down I realized how well thought out this system is. All the hardware on the Motonaut system is high quality. There are steel rings where all the straps come together and effective steel cam buckles to hold your straps in place. The square rings for small adjustments are heavy duty and the webbing looks great with the Motonaut logo on one side. Motonaut is not currently sold in the USA, but a quick currency conversion shows that the Motonaut sells for $109 USD. When I was looking at the Motonaut online I felt like the price was a bit high for what it was, but after I got the system in my hands and took it for a ride my mind was changed. I would be willing to buy another Motonaut system if this one was broken. Altogether the Motonaut Adventure and two NRS 38 liter drybags will cost about $180. Compared to adding racks and luggage with other products the Motonaut has a good balance between price and capacity while retaining a great deal of portability and flexibility. Motonaut strapped down to rear rack. It took me about 30 minutes to get the Motonaut Adventure on my Kawasaki KLR650 the first time. I didn't have directions in my box, but I did remember the instructional video I saw online so I pulled that video up and took the laptop outside so I could follow along as I installed it. I put the bags on several times and took them back off to get everything adjusted just right, but this really only needs to be done one time unless you change the size of your bags. If you change your bags you may need to fine tune it again. I found it confusing at first, but once I figured out how it worked, it all made sense to me and I haven't had to refer to the directions again. One mistake I made, and you may notice it in the pictures, is I crisscrossed the straps on the front bag. In the instructional video it looked like I was supposed to cross the straps. The straps held fine until I got on the rough gravel roads and they started bouncing a bit. I started thinking about it and I realized my mistake. After stopping for lunch I loaded the bags up with the straps properly installed without the crisscross. The bags hauled much better after that, but there was still a small amount of front to back movement. With the inclusion of the shorter straps you can set up the Adventure system where you can remove each dry bag separately. When you use this feature of the Motonaut there is more slack in the straps left. I had a couple of plastic buckles laying around, so I utilized these straps to hold my tripod down in between the dry bags. This is not something Motonaut advertises, but it just goes to show how flexible this system is. Another perk of having such a small, adaptable, and lightweight system is destination riding. If you plan a motorcycle trip where you will be flying to your destination and renting a motorcycle you can easily pack your motorcycle luggage and carry it with you. You can save money on renting luggage and you know ahead of time that you have the luggage system you prefer for your adventure. Motonaut says the Adventure system will hold two bags and accommodate up to 120 liters of luggage. When I was on my ride I had two NRS 38 liter dry bags strapped in. With a little more adjustment I could have easily had more slack in the straps for larger bags or taken up the slack for smaller bags. Traditional luggage systems often require racks that add weight to your bike. The Motonaut adventure weighs 17.4 ounces and my dry bags weigh 23 ounces each. Using this system my luggage only adds 3.96 pounds to my motorcycle and it is completely waterproof and won't break my leg if I fall! I found the Motonaut a little confusing to install the first time, so I think better instructions would have been helpful. As for the system itself, I think it worked well. Motonaut did inform me that they are planning to enhance the system by color coding one of the straps with the steel rings to make it easier to install. Currently the only difference between the two straps with the silver steel rings is the length of the webbing they are attached to. After they color code the new version it will be even easier to identify which one to use. I finally figured out that the small amount of movement still present after correcting the straps was coming from the way the Motonaut attaches to the luggage rack in the rear. It has two rectangular rings and you thread the webbing through the rings the way you would thread a helmet strap. You can get it tight when you install the straps, but the vibration and movement will loosen it causing your bags to shift forwards and backwards a small amount. Its not a problem and it will not come off your bike, but some small improvements to the way it attaches in the rear would allow your luggage to be held much firmer and eliminate all movement. The last suggestion I have is finding a way to provide more bag placement adjustment. It would be helpful to have a larger range of front to back adjustment to fine tune where your bags carry. There is some adjustment, but it is limited by the rear attachment method. 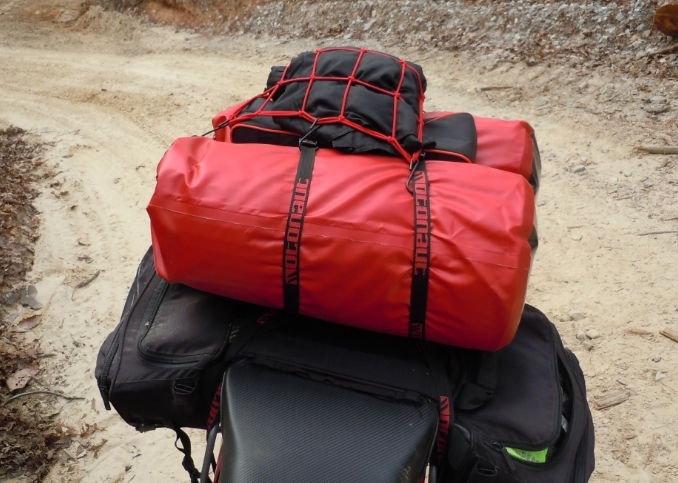 The Motonaut Adventure luggage system performed well for me, even when I was catching some air on the gravel roads. The biggest issue I had with movement was because I didn't install it properly. Once I corrected my mistake the bags carried better with only a small amount of movement. I was still able to easily access my saddlebags and it was quick and easy to load and unload for camping. I think Motonaut is a well designed lightweight luggage system. With the addition of instructions they will have a well-rounded offering. Motonaut is not currently sold in the USA and as far as I know Ben Rainchild of New Mexico Motorcycle Adventure Touring and I are the only people in the USA that have had the pleasure of using the Motonaut. If you are interested, contact Motonaut and let them know you want their products in the USA. I went down right here. Motonaut still in place!